It’s sorta surprising, sorta not that Sangiovese is mentioned by so many people as their favourite Piggs Peake red. Stylistically, it’s the complete opposite of what we traditionally do. Sangiovese is the dominant grape in the wines of Tuscany. In more recent times the Italians have blended French varieties into their Sangioveses with wonderful results. Traditionally, it makes a lighter bodied dry red which tends to savoury as opposed to fruity. Its one of the great arguments of the wine world whether wine should be fruity or savoury. Savoury wines are often referred to as food wines while fruity wines are described as good drinks. Italians tend to drink wine when they eat so the varieties they have chosen over the years for their wine industry make more savoury styles of wine. 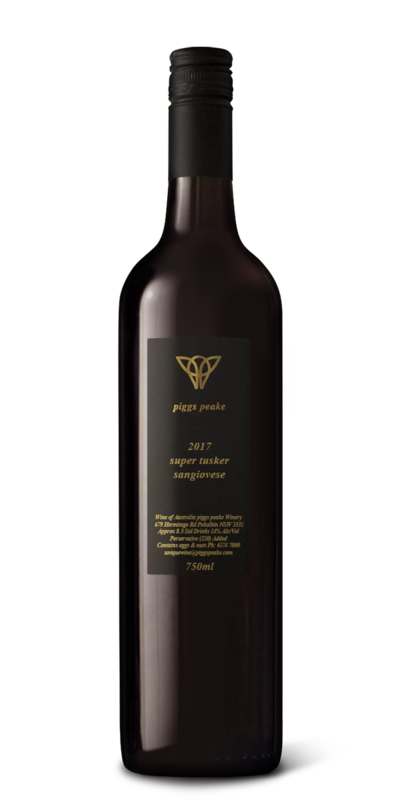 The Piggs Peake Sangiovese is grown in Mudgee which I view as a great site for the Italian varietals. The climate out there tends to result in a Sangiovese which is interesting but not excessively tart as a cooler climate can tend to produce. We take a leaf out the Italians book and blend a small amount of Shiraz from Orange into our Sangioveses which gives the palate a little more richness. These are light reds but with a big tannin structure. Traditionally, these wines are drunk with similarly lighter meats like duck or suckling pig which have a higher fat content so that the tannins have something to act on.